Summers Corner is a 6,000 acre master planned community, with the first phase coming to life fall of 2016. The foundation of this community’s story is the garden, with the vision that the garden ethos encourages the community to get back to nature, back to simple. Two Forks initial project scope utilized the “bird house” as a multi layered symbol, intended to activate the entrance to the community in a way that would attract perspective buyers, incorporate the vision and engage the community through a series of programed events with local partners. During discovery, the intent and scope of the project shifted toward a more meaningful consideration of natural habitats. In tandem with the landscape architect it was agreed that this intersect of art and nature could establish a richer and more diverse habitat for birds and other wildlife, a fuller embodiment of the vision that would permeate throughout the community. Presently we have established 13 locations in parks and gardens in phase I that will have a combination of native plantings, roosts, nest and man made cavities specific to regenerating a diverse habitat. 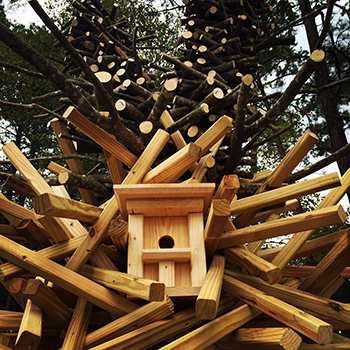 There will also be five large scale environmental sculptures intended to service a variety of bird species. In addition we have initiated a framework of educational programing through partnerships with Clemson University Extension, Master Gardeners, Master Naturalists, and the South Carolina Bluebird Society. Installation of landscape and habitat areas will occur summer of 2015. Our hope moving forward is to encourage MWV to participate in the process of becoming a certified community wildlife habitat through the National Wildlife Federation.